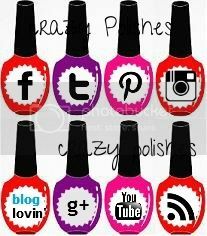 Crazy Polishes - nail arts, swatches, reviews Crazy Polishes: Spring Nails!!! It's finally started to feel like spring here in Belgium, weather is warming up and so good to have more daylight. So, that inspired me to do a floral manicure. i didn't do double-stamping from such a long time so for this manicure i stamped two images and a holographic top coat in the base. stamping polishes - konad "white stamping polish" and colour alike "juicy tangerine"